Anihan Industry Partner, Ms. Beatriz Melendrez, Proprietor of Flour Jar conducted a demo session of baked pies and cakes at Anihan Technical School grade 11 and 2nd year students. This was held last July 21, 2016. Preheat oven to 325 degrees F (165 degrees C). use a 10 inch cake pan. In a large mixing bowl, beat egg whites and cream of tartar until stiff peaks. Set aside. Using same beaters, beat egg yolk batter until smooth and light. Pour gradually over egg whites, folding in with rubber spatula. Do not stir. Pour batter into the 10 inch cake pan. For the whipped cream, make sure the whipped cream is very cold before you whisk it. Whisk until it is stiff. Mash 100 grams of diced strawberries and mix in with 300 grams of whipped cream. Set aside in the chiller. Dice up the cool chiffon cake into cubes. Set aside. Dice up the 200 grams of strawberries. Set aside. Use an 8 inch spring form pan and cover the sides with acetate. Assemble the cake: first layer is the diced up chiffon cake, second layer is the strawberry whipped cream, third layer are the cut fresh strawberries, forth layer is the whipped cream. Repeat the process 2 more times. The last layer should be whipped cream and decorate with strawberries. Put in the chiller to set for 1 hour to 2 hours. For the crust, mix the flour, salt, and sugar in a food processor fitted with the steel blade or a medium bowl if doing this step by hand. Scatter chilled vegetable shortening over the flour mixture and process (or cut in by hand with a pastry blender or two knives) until the mixture resembles coarse crumbs. Scatter the chilled butter pieces over the flour mixture and pulse again (or cut in by hand) until the mixture resembles coarse crumbs. If using a food processor, dump the mixture into a medium bowl. Sprinkle 4 tablespoons of the ice water over the mixture. Stir and press the dough together, using a stiff rubber spatula, until the dough sticks together. If the dough does not come together, stir in remaining ice water, 1 tablespoon at a time, until it does. Spread a piece of plastic wrap on the counter and gently press the dough into a 4-inch flattened disk on top of the plastic wrap (the dough might still be a little shaggy, which is ok - it doesn't need to be as smooth as, say, sugar cookie dough, it just needs to be able to stay mostly together in a lump). Wrap tightly in the plastic wrap and refrigerate for 30 minutes. Let it sit on the counter to soften slightly, about 10 minutes before rolling. Preheat the oven to 375 degrees. Generously sprinkle your counter top or other work area with some of the graham cracker crumbs. Place the chilled disk of dough in the center of the crumbs. Scatter a few more crumbs over the top of the dough. Using firm, quick strokes with the rolling pin, roll the dough into a 12 or 13-inch circle, taking care to continue sprinkling additional crumbs (feel free to be heavy-handed with the sprinkling since it is better than having the crust stick and tear) underneath and on top, as necessary, to heavily coat the dough. Loosely roll the dough around the rolling pin and gently unroll it onto a 9-inch pie plate. Instead of pulling and stretching the dough to fit, gently lift the edges with one hand while easing the dough into the bottom of the plate with the other. Trim the crust to about 1/2-inch beyond the edge of the pie plate. Fold the excess overhang under itself so the folded edge is flush with the edge of the plate. Crimp the crust with your fingers to create a scalloped pie edge. Refrigerate the pie shell until firm, about 30 minutes. Line the chilled pie shell with a double layer of aluminum foil, covering the edges so they don't burn, and fill with dried beans, pie weights or other oven-safe weight. Bake until the pie crust looks dry and is light in color about 20-25 minutes. Remove the weights and foil carefully and continue to bake the crust until it is a golden brown, about 5-10 more minutes. Transfer the pie plate to a wire rack to cool completely while you make the pie filling. For the filling, whisk the sugar, cornstarch, and salt together in a medium saucepan. Whisk in the heavy cream, followed by the egg yolks and finally the milk until the mixture is smooth. Bring the mixture to a simmer over medium-low to medium heat, whisking constantly, until the mixture thickens and becomes smooth. This could take anywhere from 5-10 minutes from start to finish so be patient if it doesn't thicken quickly. The finished texture and thickness should be that of a not-quite set pudding - very thick but not gelatinous. Remove the pan from the heat and if desired, strain the mixture through a fine-mesh strainer to get rid of any possible lumps or little bits of cooked egg; whisk in the butter and vanilla to the hot pudding (strained or not, it's your choice). Let the mixture cool until just warm, stirring often, about 5 minutes. Pour half of the warm filling into the pre-baked pie shell. 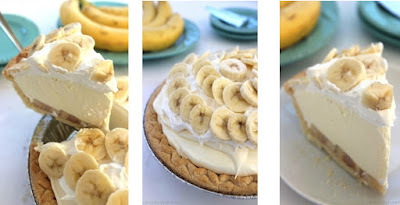 Peel and slice the bananas thinly on top of the filling and top with remaining filling. Lay a sheet of plastic wrap directly over filling surface. Refrigerate pie until it is completely chilled, at least 3 hours or up to 6 hours. For the topping, whip the cream, sugar and vanilla together until soft peaks form. Spread or pipe the whipped cream over the top of the pie. Refrigerate until ready to serve. The pie is best made and served the same day so the banana slices don't get mushy and browned.